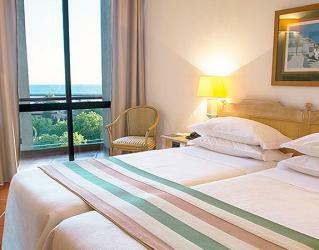 Dom Pedro Marina Hotel surrounded by excellent golf courses in the region. Dom Pedro Group also organizes the Dom Pedro International Golf Classic Tournament every year. Dom Pedro Marina is a lovely four-star boutique hotel, located in the modern marina district with many beautiful restaurants overlooking the glistening Atlantic Ocean and the Yacht harbour. The Casino is very close to the hotel. The free shuttle service to the golf courses in Vilamoura will please the golfers. 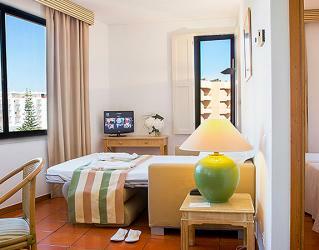 The accommodation options at Dom Pedro Marina are classic rooms with balcony and suites in several types. 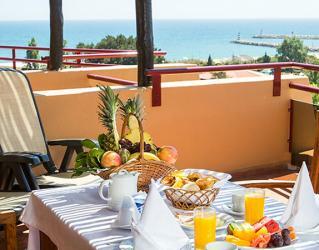 They are all decorated comfortably and have the fabulous views of the sea, Vilamoura Marina or the hotel gardens. 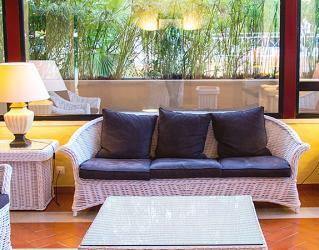 The rooms adequately equipped with air conditioning, TV, telephone, radio, safety deposit box, minibar and hairdryer. 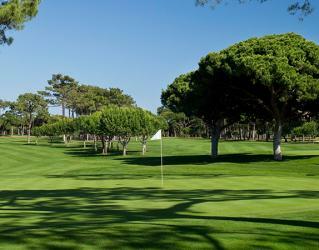 There are several golf courses around in Vilamoura for different levels of golf enthusiasts. You can choose Dom Pedro Victoria 18 holes, Dom Pedro Old Corse 18 holes, Dom Pedro Millennium 18 holes, Dom Pedro Pinhal 18 holes, Dom Pedro Laguna 18 holes. 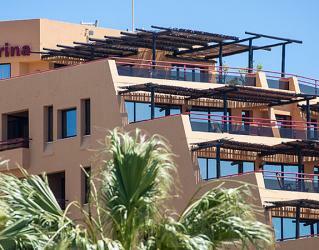 In the two restaurants of the hotel, meals are prepared using fresh and local products by Chefs. The buffet breakfast, lunch and dinner served in the Da Pietro Restaurant; which, set in a charming trattoria-style atmosphere, offers delicious A’la Carte Italian and Portuguese dishes, as well. Búzios Beach Club, the restaurant and bar on the beach, serves various tasty dishes in a modern and elegant ambience across the outstanding view of the sea. Room service is available in the hotel. Please note that the availability of restaurants may change seasonally. The Tropical Bar at Dom Pedro Marina, located by the swimming pool is a stunning spot to catch some rays on a day off from golf while savoring a cocktail with a snack. Piano Bar, located in the lobby, awaits you for a drink from morning till midnight with its unique and artful decoration of bamboo and plants. There is so much to do in the surrounding area. From a buzzing nightlife with bars, restaurants and clubs, to horse riding and a fabulous Casino, Vilamoura will have you entertained, whatever you fancy doing! The Dom Pedro Victoria , which covers some 90 hectares, is the most recent golf course project of Arnold Palmer in Portugal. As one of the best and most sophisticated golf courses in Europe, every care has been taken to ensure the preservation of the wetlands and the typical vegetation of carob, olive and almond trees. Several lakes, occupying 13 hectares, provide mirrors of water and strategic reservoirs for irrigation. The course features 5 or 6 tees per hole; wide, undulating fairways; extensive water hazards and cleverly positioned bunkers. 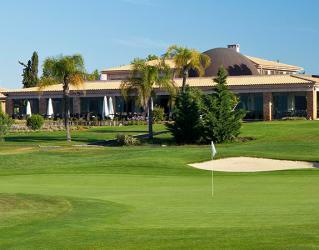 In addition there is an exceptional driving range and a putting green of some 2,500m². This conventional PAR 72 course opened in the year 2000, although the original back nine was formerly part of the 27-hole Laguna Course. Refurbishment to the existing nine holes commenced in May 1999 and included the complete rebuilding of the tees, greens and bunkers, particularly for holes 8 and 9, the only ones on this loop with water hazards, with the aim to simplify the strategy of the course to make it more golfer-friendly. The renovated 9 holes were joined together with the new 9-hole loop to offer a layout of different character, style and playing quality. The work was undertaken by the well-established UK golf Architects Hawtree & Sons which culminated in the creation of the new, exciting 18-hole Dom Pedro Millennium golf course. The course is particularly open, although some holes (the 3rd to the 7th) wind between pine trees and are similar to the neighbouring fairways of the Dom Pedro Old Course and Dom Pedro Pinhal. In this more wooded area, the fairways are narrower and require greater accuracy - while the rest of the course has a clear landscape enriched by lakes at the 4th, 17th and 18th holes. The arrival of the Dom Pedro Millennium course made Vilamoura one of the main - if not the main - European golf destinations. 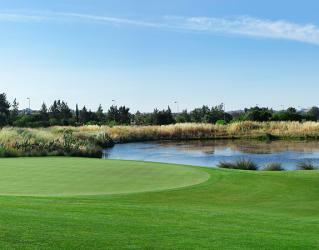 Measuring 6121m from the white tees, the par 72 course includes several lakes which influence play on a total of 11 holes. In addition to acting as hazards and emergency water reservoirs, these lakes serve a useful purpose in attracting a variety of aquatic birds, both resident and migratory, as well as amphibians, otters and terrapins. 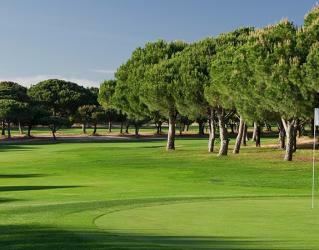 Vilamoura's master developers, Lusotur, have also established an environmental nature park not far from the course. 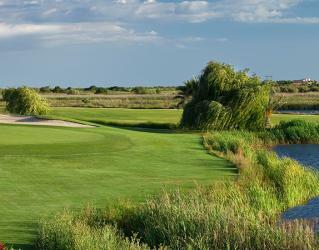 The Dom Pedro Laguna course shares a large, welcoming clubhouse with the neighbouring Dom Pedro Millennium course. This was the second golf course built in Vilamoura and inaugurated in 1976, having originally been designed by Frank Pennink, the architect of the nearby Dom Pedro Old Course. Several refinements were incorporated over the years, the most significant one by Robert Trent Jones Sr. in 1985. The course is typified by rolling parkland terrain covered with numerous umbrella and Atlantic pines that line many of the fairways and a few even stand out on fairways or near greens. Ponds and a stream come into play on five holes but are not serious threats to above-average golfers. To keep up with modern technical advances in clubs and balls, several holes have recently been lengthened and the PAR 72 course now measures 6353m off the white tee markers. The clubhouse was completely renovated and modernised at the turn of the millennium and from the large veranda one can enjoy a panoramic view over the excellent driving range and practice facilities. Situated in the heart of Vilamoura a mere 20 minute drive from Faro airport, this Frank Pennink designed parkland style layout is one of the oldest in the region and renowned all over the golfing world. Often described as the Grande Dame of Algarve courses, it meanders throughout impressive pine trees - the principal hazard - over gently undulating natural terrain. Although it opened in 1969, the course was completely renovated and modernised 27 years later although no major changes were made to the magnificent layout. In addition to raising the Dom Pedro Old Course to new heights of quality, an attractive new clubhouse and adjacent putting green were also built at that time. As with all Dom Pedro courses, environmental protection practices are strictly adhered to by means of detailed management systems in line with guidelines established by ISO 14001 standards, Green Globe and Committed to Green programmes. This is one of the courses in Portugal that will always stay in the memory of visiting golfers.